Chinch bugs may be the best-known lawn pest in Jacksonville, but there are diseases that are pests too. Florida summers are hot, humid, wet and muggy. This ecosystem is perfect for certain diseases to thrive in. Maintaining a healthy lawn is key to disease prevention. This can be quite hard, and the summer brings even more challenges with the intense heats. Maintaining a good lawn during the summer is possible though. Don't cut your grass too short. Don't get rid of lawn clippings. Use fungus, pest, and weed prevention. Mow your lawn when its dry. St. Augustine grass is generally afflicted by 3 lawn diseases, Gray leaf spot, Brown Patch and take-all root rot. These diseases can generally be avoided by proper lawn care practices but when contracted you may need professional help for removal. Gray Leaf Spot is a fungal disease that occurs most commonly on St. Augustine grass. On St. Augustine the initial spots are brown and small, they expand quickly into large, round gray or tan spots that are surround by a purple or brown border. The leaf may also develop a yellow border or just completely turn yellow. During the summer weather the fungus will produce grayish mycelium and spores on unhealthy grass. If these spots are numerous the grass will most likely wither and die. When under favorable disease developing conditions, large patches will appear to be scorched. Gray leaf spot is common when temperatures are between 77 and 86 degrees fahrenheit, with rainy and humid weather. The fungus survives dry summer conditions as fungal mycelium and spores on dead foliage and in the thatch layer. Brown patch In northeast Florida, Brown Patch is usually seen in the fall and early winter Months. The appearance of brown patch can vary, but generally, you will see browned grass patches, anywhere from a foot to three feet in diameter, in a roughly circular shape, with a darkened colored border. 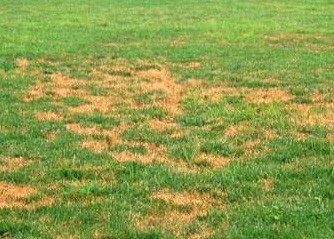 The grass inside the patches will have brown lesions and will usually thin significantly, but can also die completely. You will be left with sparse patches of grayish looking turf. Take-all Root Rot first symptoms show up in spring and summer. The lawn has a yellow-green cast from the yellow leaves. As the fungus progresses a severe thinning in irregular patches occurs. If all grass dies in an area it is soon replaced with weeds. St Augustine grass with a "heavy dose" of root rot, looks patchy in decline when accompanied with a weak root system. In areas where St Augustine grass does not go completely dormant, the greatest recovery from the fungus happens during the winter. However, when spring rains return, often so do the symptoms. So far the "best" solution for control is not chemical but proper turfgrass management practices.. Most fungal problems are avoided by using good cultural practices (proper watering, fertilizing and mowing). When disease problems do arise, it is best to hire a professional.